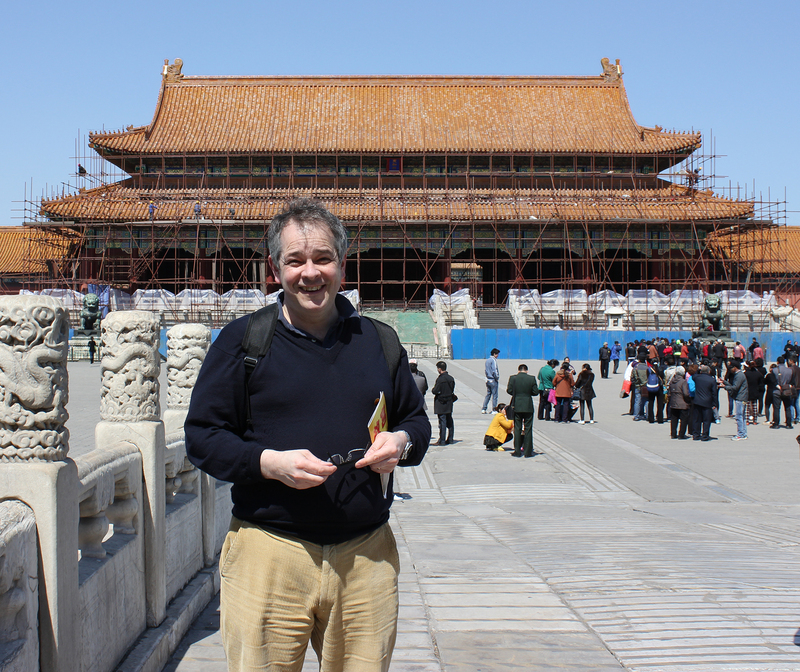 A rare and important archaistic Chinese jade ceremonial blade from the late Shang/early Zhou Dynasty (11th – 15th century BC) has been discovered by Toovey’s specialist, Mark Stonard. This remarkable object formed part of the collection of the late Fred Clark, a gifted and meticulous antiquarian, whose collector’s label it bears. It is believed that Fred Clark bought it in the years immediately after the Second World War. The blade has an older hand written paper label which offers a translation of the Chinese calligraphy engraved into the jade and also a printed paper segment which reads ‘Beasley Collection’. It is always the cause of some excitement when an archaic piece surfaces bearing the name of the early 20th century collector Harry Geoffrey Beasley (1882-1939). Between 1895 and 1939 Beasley put together one of the largest collections of ethnographic material in Britain. The collection was formed of more than 10,000 objects from Asia, Africa, Scandinavia, and across the world. In the years after Beasley’s death in 1939 the majority of the collection was donated to leading British Museums. 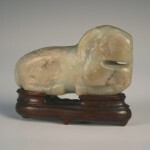 The Chinese have always prized jade more highly than gold. 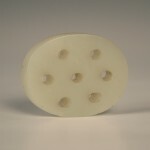 This hard translucent stone has, over the centuries, been worked into decorative and ritual objects as well as ceremonial weapons. 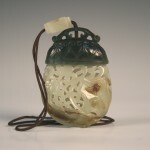 Jade was worn by kings and nobles in life and was buried with them, affording the material a high status and associations with immortality. The Chinese way of life was based on a combination of faith, tradition and ethics which bound families and communities together. The Chinese philosopher, Confucius (551 BC – 479 BC), emphasized the moral responsibility that accompanies authority. Confucius established a school with a radical new principal of accepting students of sufficient intelligence regardless of their background or ability to pay. He combined this belief in meritocracy with a faith in the generous order of a hierarchical society. 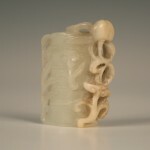 The hierarchical principles expressed in Confucianism may, perhaps, give some insight into the use of this jade blade. A ruler had a right to obedience and respect but equally had a duty to act justly in the best interests of his subjects. Many academics believe that jade objects like this blade were symbols of office. If this is correct it is probable that blades of this type were used in a similar way to ceremonial jade Kuei tablets of the period. A high ranking courtier would have held the blade to his mouth and spoken through it when addressing the Emperor. When you hold this ancient ceremonial blade you become aware of the exquisite workmanship employed in its making. 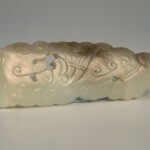 The balance and line of the blade work in concert with the patterns in the jade. It has the power to move you and a particular, vital quality to it. This late Shang/early Zhou Dynasty jade ceremonial blade has just returned from exhibition at the International Asian Art week in London where it attracted much attention and is expected to realise thousands of pounds when it is auctioned at Toovey’s specialist Asian Art sale on Thursday 30th November 2017. 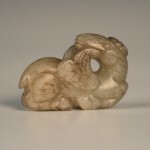 The Chinese have always prized jade more highly than gold. This hard translucent stone has, over the centuries, been worked into decorative and ritual objects, as well as ceremonial weapons. Jade was worn by kings and nobles in life and was buried with them, affording the material a high status and associations with immortality. 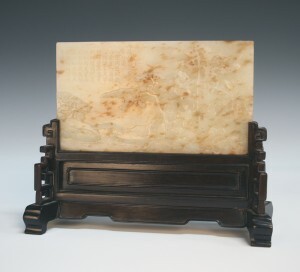 Later it was the exquisite objects fashioned from this remarkable stone which continued to be highly prized, connecting the Ming and the Qing periods with earlier times. The English translated the Chinese word ju as jade. 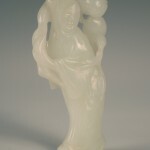 Our interpretation of jade is narrower than that of the Chinese including only nephrite and jadeite. 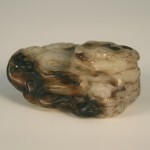 Nephrite is typically white in colour. However, the presence of copper, chromium and iron can gift it with colours ranging from subtle grey-greens to brilliant yellows and reds. Jadeite has an even broader spectrum of colours and was notably employed from the 18th century. It was an extraordinary moment when I discovered the exquisite small jade table screen in a modest flat in Richmond. 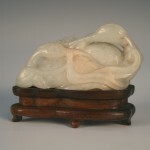 It realized £120,000 in a Toovey’s specialist Chinese and Asian Art Sale, selling to a Chinese connoisseur. The 18th century panel is delicately carved with a shoreside scene. It portrays a meeting of scholars. In the corner you see nine beautiful lines of calligraphic text. On the reverse is a scene depicting a figure in a garden hut; six further figures sit beside a stream flowing from a waterfall. 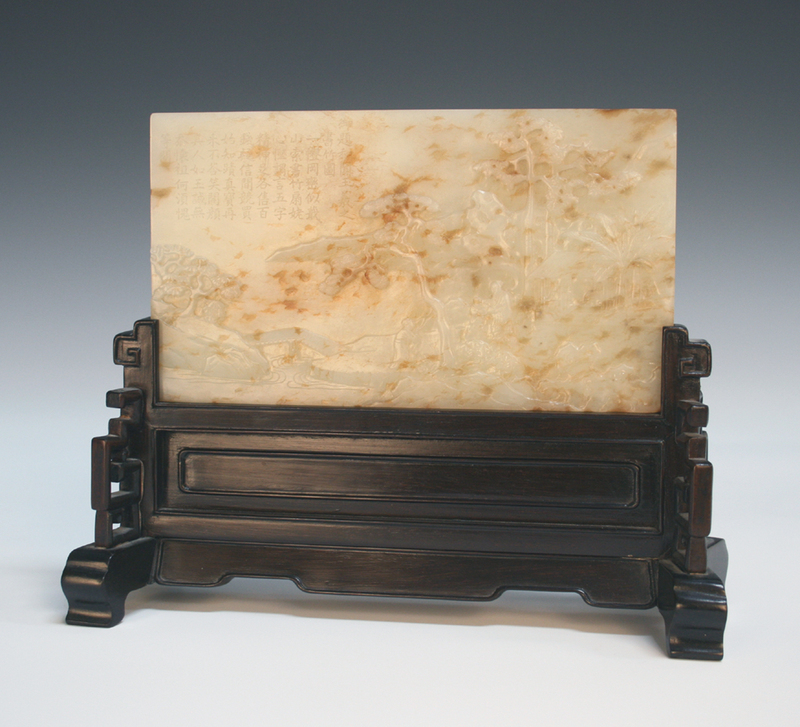 Jade workshops created pictures on jade, often following the themes and conventions of Chinese painting. Chinese depictions of nature are seldom just representations of the landscape. Rather, they reflect the artist’s spiritual, emotional and intellectual reaction to the natural world. It is a tradition which connects the artist with their ancient civilisation. The 18th century Chinese pale celadon jade lotus bowl’s decoration reflects the influence of Buddhism. The lotus flower, upon which the form of this bowl is modelled, represents purity and enlightenment. Repeated lotus flowers also decorate the lid. The body has a frieze of petals each containing one of Buddhism’s eight emblems, including the Dharma Wheel. The wheel symbolises the auspicious qualities of the turning of the Buddha’s teachings, in all realms and at all times, enabling beings to experience the joy of servanthood and liberation. The bowl and cover was auctioned at Toovey’s for £52,000. The term libation refers to the ritual pouring of a liquid as an offering to a god or a spirit. The Chinese traditionally poured rice wine or tea left to right in front of an altar as an offering to their gods in honour of the deceased. 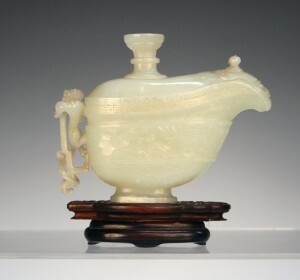 The Chinese archaistic jade libation vessel once again dates from the 18th century. The sides are finely carved with stylized birds against clouds whilst the handle is entwined by a dragon. This ritual object was sold at Toovey’s for £70,000. 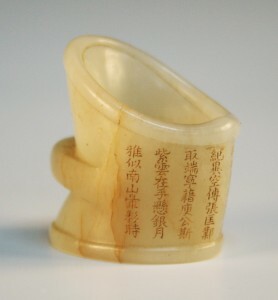 The ceremonial Chinese Imperial quality jade archer’s ring dates from the Qing dynasty. It is carved in the form of a horse’s hoof and finely incised with an eight line text. The characters are heightened with gilding. It realised £40,000 at Toovey’s. 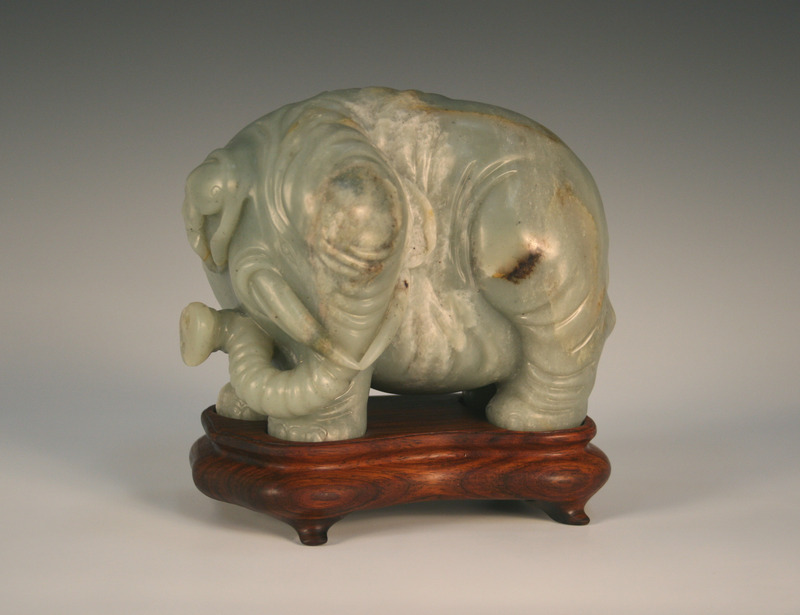 The Chinese and Asian Art Department at Toovey’s has been established for twenty years. Over all these years the Antiques Roadshow specialist, Lars Tharp, has worked closely with Toovey’s resident specialist, Tom Rowsell. 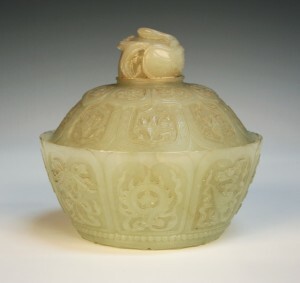 Toovey’s particular success has been to connect its selling clients directly with wealthy Chinese mainland collectors who, like their forebears, value jade more highly than gold. Tom and Lars are always pleased to discuss the acquisition or sale of Chinese and Asian Art. They can be contacted by telephoning 01903 891955. By Revd. Rupert Toovey. Originally published on 26th August 2015 in the West Sussex Gazette. 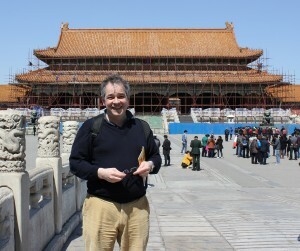 Toovey’s will be represented by the British Ambassador to China at the official launch of an exciting new professional group, comprising twenty-one of the leading regional auction houses in the United Kingdom, at the British Embassy in Beijing this April. These auction houses, which have a combined annual turnover in excess of £200 million, have united to become a dominant UK force in the lucrative Chinese market. 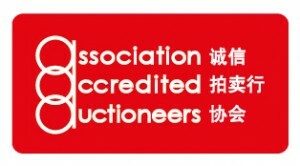 In an unprecedented move, they have launched AAA (The Association of Accredited Auctioneers) and forged commercial links with Asia’s only online live bidding portal, www.epailive.com, which now promotes their sales directly to more than 100,000 registered collectors of fine art and antiques in China and posts their catalogues translated into Chinese online. Toovey’s Oriental Department holds six specialist auctions of Chinese, Japanese and other Far Eastern ceramics and works of art a year and holds regular valuation days. Department head Tom Rowsell and his consultant, BBC Antiques Roadshow expert Lars Tharp, have over the last fifteen years built one of the pre-eminent specialist auction departments in the UK. “The influence of the Chinese on the UK auction market cannot be underestimated,” says Tom Rowsell. “Our web presence through www.tooveys.com has complimented the depth of our expertise by providing our clients with accelerated marketing and an international shop window for the sale of their objects. 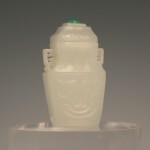 Rare Chinese pieces still command the highest prices but there is now a tremendous demand for British antiques in China, particularly furniture, silver, jewellery, clocks and watches, and we hope that the AAA project will encourage more and more mainland Chinese to buy items in all the specialist sections in our auctions. The Chinese jade table screen that sold for £120,000 (featured previously) was one of the more memorable auction prices achieved at our Spring Gardens salerooms last year. Toovey’s Specialist Sales of Oriental Ceramics and Works of Art provided numerous other highlights from objects originating from China and Japan. 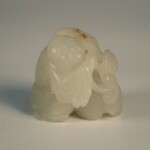 The first Specialist Oriental Auction of 2012 at Toovey’s (and the first of the Chinese New Year) on Thursday 23rd February includes a collection of mostly 18th and 19th Century jade carvings (Lots 1105 to 1119), consigned from the estate of a lady collector, late of Banbury, Oxfordshire. 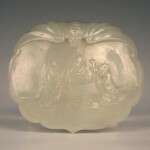 The consignment includes pendants, vases, carvings, inkstones and plaques. 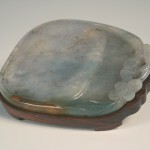 A collection of other jades have also been consigned from other vendors. Jade is a mineralogically imprecise term for various kinds of hard-stone, more frequently referring to nephrite (a calcium magnesium silicate) and similar jadeite (a sodium-aluminium silicate). The wide-embracing term ‘jade’ can in fact encompass over 150 different varieties of stone. The English term for what in China is called yü (玉) is derived from the Spanish piedra di hijada, or ‘stone of the loins’, as it was believed to be healing to that part of the body. “In ancient times“, said Confucius, the Chinese thinker and social philosopher, “men found the likeness of all excellent qualities in jade. Soft, smooth, and glossy, it appeared to them like benevolence; fine, compact and strong – like intelligence; angular, but not sharp and cutting – like righteousness; hanging down [in beads or pendants] as if it would fall to the ground – like [the humility of] propriety; when struck, yielding a note, clear and prolonged, yet terminating abruptly – like music; its flaws not concealing its beauty; nor its beauty concealing its flaws – like loyalty; with an internal radiance issuing from it on every side – like good faith; bright as a brilliant rainbow – like heaven; exquisite and mysterious, appearing in the hills and streams – like the earth; standing out conspicuously in the symbols of rank – like virtue; esteemed by all under the sky – like the path of truth and duty” [Legge (translator): Li Ki, Book XLV.] 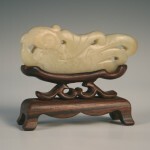 Since Neolithic times jade has been of central importance in China. No other stone has had such a continuous relationship with humankind in our social and religious development. Centuries before the Christian era we find it arbitrarily symbolic of Heaven and Earth. 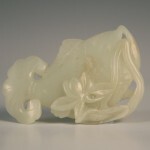 It is this representation of virtue and its symbolic history that ranks jade as the most precious of stones amongst the Chinese. Lot 1105 (illustrated above), to be offered for sale as part of the collection in the February auction, is carved from a stone of celedon green tone. 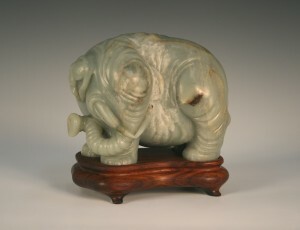 The elephant is symbolic of prudence, strength and wisdom and has always been sacred to Buddhism, this 15cm long carving carries a pre-sale estimate of £1000-1500. Many of the carvings offered in the February auction are of auspicious animals, chosen for their specific symbolic meanings. The Banbury collection to be offered in Toovey’s February Specialist Sale includes Chinese works of art decorated with the ram (a symbol of kindness and patience), fish (symbols of rank and power and later, the symbol of marital bliss), Buddhistic lions (often placed at the entrance of religious buildings, and associated with upholding the law), cranes (endowed with many mythical attributes and considered the aerial courser of the immortals), deer and Lingzhi fungus (both symbols of longevity).